Article published in Transmission and Distribution Magazine. Arc flash protective clothing is critically important in keeping electrical workers safe. 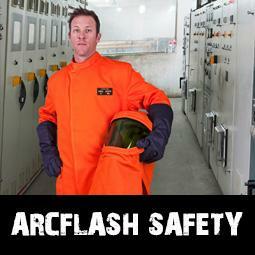 Arc flash accidents can cause serious injuries or kill. The casualties resulting from these accidents are almost always devastating to the worker involved and to the worker's family. Arc Flash hazards are a critical and unavoidable safety issue for electrical workers. An Arc Flash is an electrical current that is passed through air when insulation or isolation between electrified conductors is no longer sufficient to withstand the applied voltage. An Arc flash incident is rapid and immediate and as a result, each year, significant numbers of workers worldwide are maimed or killed from Arc Flash exposure. What standards should your Arc Flash protective garments comply to? Hoods and faceshields: ASTM F2178-08 Standard Test Method for Determining the Arc Rating and Standard Specification for Eye or Face Protective Products. Garments: ASTM F2621-06 Standard Practice for Determining Response Characteristics and Design Integrity of Arc Rated Finished Products in an Electric Arc Exposure. Some manufacturers will use data provided by fabric manufacturers to make claims about the protective performance of their garments. If the fabric manufacturer claims an ATPV of 42 then some manufacturers will make the same performance claim about their hoods and garments without independent garment system testing. Anthony Elliott, Managing Director of Elliotts "There is more to an arc flash hood or garment than the fabric or fabric systems used. We have researched and tested our garments to ensure that the right seams, sewing thread, closures (buttons, Velcro® fastener or zipper), overlaps of closures and other important areas, embroidery and logos and reflective trim all pass the required standards." Arc Flash protective clothing can be the difference between life or death and are critical enough to require independent testing by a qualified testing organization. "Elliotts have sent over 120 hoods and garments to the High Current Laboratory of Kinectrics in Canada to have them tested. Kinectrics have tested our hoods to ASTM F2178 and our garments to ASTM F2621-06 which requires that the finished product be exposed to a level as close as possible to the arc rating of the fabric or system. This testing by an independent third party provides the wearer with the confidence that the hood or garment will provide the protection required in an arc flash event." said Anthony Elliott, Managing Director of Elliotts. The range of Elliotts ArcSafe Systems include W89 Series made from Walls FR 88/12 Cotton/Nylon with a HRC4 rating and ATPV of 89, W45 Series made from Walls FR 88/12 Cotton/Nylon with a HRC4 rating and ATPV of 45 and T40 Series made from TecaSafe Plus fabrics with a HRC4 rating and ATPV of 40. All Series are available in Jackets, Trousers, Coats, Leggings and Hoods. Ensure your clothing system has the level of arc rating to meet your arc flash hazard assessment levels? Ensure all components of your suit including the hood, jacket/trouser or coat/legging is the same ATPV rating. Ensure all closures are securely fastened. Ensure that the sleeves of the protective work wear go down to the hand, leaving none of the arm exposed. Ensure that no skin is exposed. Learn more about Elliotts ArcSafe and the latest testing results and ArcSafe Systems available at elliottaustralia.com.